Debs, Judy Boss (Wong) passed away on February 9, 2016 surrounded by her loving family after a prolonged battle with cancer. She was a child actress appearing in such movies as the Hollywood film production of the Flower Drum Song. She was a ballerina and synchronized swimmer. At UCSB she majored in Studio Art. This developed into a life long support and enjoyment of the arts. 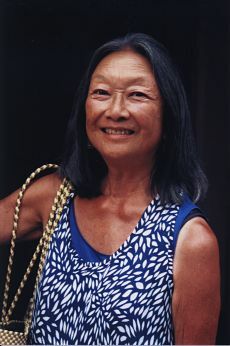 In retirement she was involved with Santa Barbara Continuing Education in painting and jewelry-making classes. She loved to collect unique jewelry pieces and eclectic works of art. This visual sensibility was also reflected in her personal style of dress. Judy received her BA and Teaching Credential from UCSB. During her 37-year teaching career in Santa Barbara, she worked at Franklin and Adams Elementary Schools, and one year she taught in the ESL Department at SBCC. At Roosevelt Elementary School she met her future husband, Charlie, and taught with him for the remainder of her teaching career. She loved and nurtured all of her students. She was involved at the beginning stages of the bilingual education program in the Santa Barbara School District and taught in this program until its demise. Her love of the Spanish language and Hispanic culture developed while living in Caracas, Venezuela with her family. Judy and Charlie traveled extensively all over the world. Her favorite places were France and Indonesia. She loved sailing, particularly on her last trip from Bali to Nusa Tenggara. Judy was a bright spirit, warm, loving, giving, supportive, intelligent, and up beat. She will always be remembered for her infectious laugh and big smile. She leaves behind her loving husband Charlie, with whom she enjoyed 30 years of her life. She found so much joy with her extended family, especially her niece Beth and nephew Joe and their children. She was a “cool” and creative aunt! Her brother Ralph Jr., dear cousins, and her husband’s family with whom she was very close and supportive also survive her. Her parents, Ralph Sr. and Rose (Lee) Wong and sister, Janet Wong, preceded her in death. A celebration of her life will be held at Saint Barbara Greek Orthodox Church, 1205 San Antonio Creek Rd., from 2:00-5:00pm on Saturday, March 12, 2016. In lieu of flowers the family would appreciate a donation to CALM.